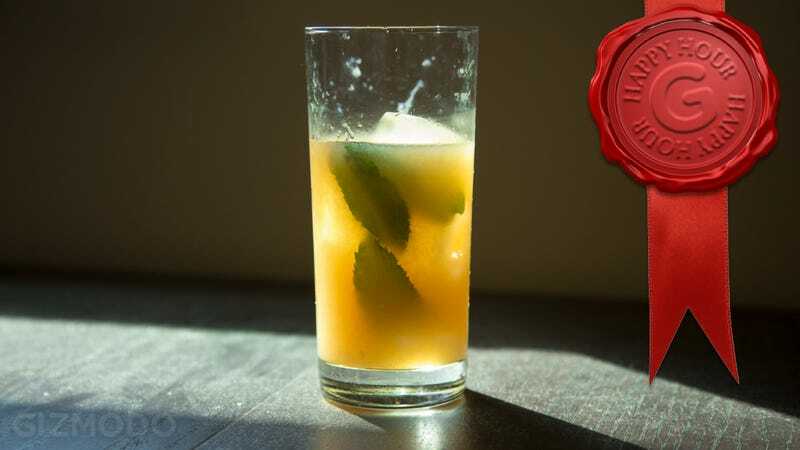 It's Friday afternoon, you've made it through the long week, and it's time for Happy Hour, Gizmodo's weekly booze column. A cocktail shaker full of innovation, science, and alcohol. It takes a dog to beat a dog (day). The Greenhound is a riff on two drinks: The Greyhound and the Salty Dog. The Greyhound is simply vodka and grapefruit juice, and the Salty Dog is the same, except with salt on the rim of the glass. My good friend John McGrew brought over the makings for Greyhounds the other day, and while I like the idea of the grapefruit, I wasn't so much feeling the vodka. I was craving an absinthe drink. After a couple of days of experimentation, I arrived at what I'm going to be drinking for the rest of the summer. And maybe the rest of my life. 1. Bruise the mint leaves. You can do this by dropping them into your glass (preferably a highball glass) and gently using a muddler, or you can put the leaf in the palm of one hand, and smack it hard (clap). The idea is to release the oils without tearing up the leaf. 2. Add a few large ice cubes to the glass and then stir all of the ingredients together (except the bitters). For the salt, use something light and flaky like Maldon. Or you can go with kosher salt, if you want a little more grit. 3. Because grapefruit juice can be very sweet, very sour, or very bitter, give it a taste. Too sweet? Add a dash of bitters. Too bitter or sour? Add a little more St. Germain, or check out our variation below. 4. Drink it. Or make it for friends and be lauded for your heroic good taste. A lot of people are afraid of absinthe, and indeed, it packs plenty of flavor. For this recipe we used Pernod, which blended extremely well with the tart grapefruit juice. Neither flavor overpowered the other, and the St. Germain (with the pinch of salt) binds it all together. Just as the Greyhound has its Salty Dog variation, the Greenhound has its own. You just need one more ingredient: Pop Rocks. While everybody's favorite fizz-inducing hard candy is getting trickier to find, you can still get your hands on Pop Rocks at lot of candy stores. Ideally, you want to use the watermelon flavor, which is green, but the original cherry flavor works well, too. You're simply going to rim the glass with them (and a bit of salt). 2. Sprinkle a bit of kosher salt onto the Pop Rocks. If you only use Pop Rocks it makes the drink too sweet. The salt helps cut that sweetness, as it did in our multi-layered drink. 3. Wet the rim of the glass. You can use a lime wedge if you like, or a bit of grapefruit juice. 4. Roll the rim of the glass through the Pop Rocks/salt mixture. Fill 'er up with Greenhound, and you've got yourself a Leftover Fireworks, a fitting nod to the 4th of July, and the errant firecrackers and bottle rockets we can still hear going off everywhere. If the Greenhound was a little too sour or bitter (or abstinthe-y, if you decide it's not your thing), the Leftover Fireworks may be more to your liking. It adds a fair bit of sweetness, and, of course, the popping feeling in your mouth gives it some fun texture. Truth be told, we prefer the Greenhound as is. More good news: the Greenhound will transport fairly well. In other words, you can pre-mix all of the ingredients together in a big jug, take it to a friend's BBQ, and then pour it over ice once you get there. Just don't let the grapefruit juice get too warm for too long. Freshness is a key component to what makes this drink so refreshing. Now go forth, enjoy the rest of your weekend, and check back next week for another Happy Hour.